R.C.C. Structure design :a combination of concrete and steel reinforcement that are joined into one piece and work together in a structure. The term “reinforced concrete” is frequently used as a collective name for reinforced-concrete structural members and products. The idea of combining in reinforced concrete two materials that are extremely different in properties is based on the fact that the tensile strength of concrete is significantly lower (by a factor of 10–20) than its compressive strength. Therefore, the concrete in a reinforced-concrete structure is intended to take compressive stresses, and the steel, which has high ultimate tensile strength and is introduced into the concrete as reinforcement rods, is used principally to take tensile stresses. The interaction of such different materials is extremely effective: when the concrete hardens, it adheres firmly to the steel reinforcement and protects it from corrosion, since an alkaline medium is produced during the process of hydration of the cement. The monolithic nature of the concrete and reinforcement also results from the relative closeness of their coefficients of linear expansion (7.5 × 10−6 to 12 × 10−6 for concrete and 12 × 10−6 for steel reinforcement). The basic physicomechanical properties of the concrete and steel reinforcement are virtually unchanged during temperature variations within a range of –40° to 60°C, which makes possible the use of reinforced concrete in all climatic zones. In R.C.C. Structure design :The basis of the interaction between concrete and steel reinforcement is the presence of adhesion between them. The magnitude of adhesion or resistance to displacement of the reinforcement in concrete depends on the mechanical engagement in the concrete of special protuberances or uneven areas of the reinforcement, the frictional forces from compression of the reinforcement by the concrete as a result of its shrinkage (reduction in volume upon hardening in air), and the forces of molecular interaction (agglutination) of the reinforcement with the concrete. The factor of mechanical engagement is decisive. The use of indented bar reinforcement and welded frames and nets, as well as the arrangement of hooks and anchors, increases the adhesion of the reinforcement to the concrete and improves their joint operation. R.C.C. Structure design : Structural damage and noticeable reduction of the strength of concrete occur at temperatures above 60°C. Short-term exposure to temperatures of 200°C reduces the strength of concrete by 30 percent, and long-term exposure reduces it by 40 percent. A temperature of 500°-600°C is the critical temperature for ordinary concrete, at which the concrete breaks up as a result of dehydration and the rupture of the cement stone skeleton. Therefore, the use of ordinary reinforced concrete at temperatures exceeding 200°C is not recommended. Heat-resistant concrete is used in thermal units operating at temperatures up to 1700°C. A protective layer of concrete 10–30 mm thick is provided in reinforced-concrete structures to protect the reinforcement from corrosion and rapid heating (for example, during a fire), as well as to ensure its reliable adhesion to the concrete. In an aggressive environment the thickness of the protective layer is increased. R.C.C. Structure design :The shrinkage and creep of concrete are of great importance in reinforced concrete. 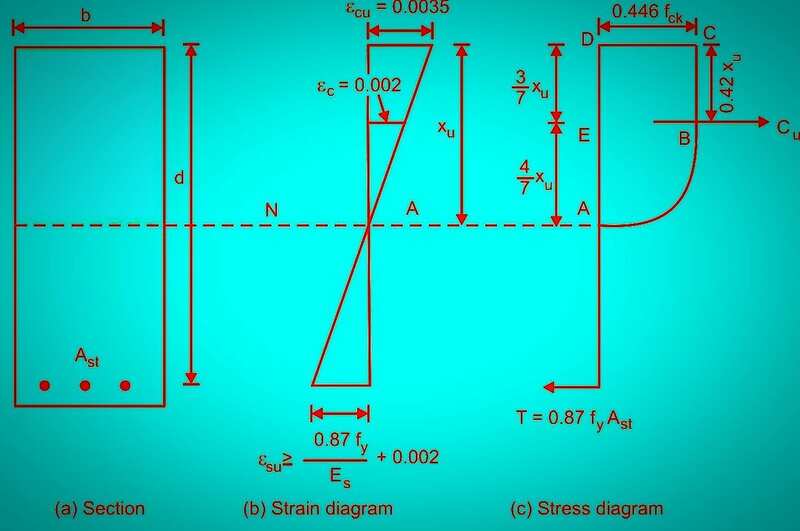 As a result of adhesion, the reinforcement impedes the free shrinkage of concrete, leading to the emergence of initial tensile stresses in the concrete and compressive stresses in the reinforcement. Creep in concrete causes the redistribution offerees in statically indeterminate systems, an increase in sags in components that are being bent, and the redistribution of stresses between concrete and reinforcement in compressed components. These properties of concrete are taken into account in designing reinforced-concrete structures. The shrinkage and low limiting extensibility of concrete (0.15 mm/m) cause the inevitable appearance of cracks in the expanded area of structures under service loads. Experience shows that under normal operating conditions cracks up to 0.3 mm wide do not reduce the supporting capacity and durability of reinforced concrete. However, low cracking resistance limits the possibility of further improvement of reinforced concrete and, particularly, the use of more economical high-strength steels as reinforcement. The formation of cracks in reinforced concrete may be avoided through the method of prestressing, by means of which concrete in expanded areas of the structure undergoes artificial compression through mechanical or electrothermal prestressing of the reinforcement. Self-stressed reinforced-concrete structures, in which compression of the concrete and expansion of the reinforcement are achieved as a result of the expansion of the concrete (manufactured with so-called stretching cement) during specific temperature-moisture treatment, is a further development of prestressed reinforced concrete. Because of its high technical and economic indexes (profitable use of high-strength materials, absence of cracks, and reduction of reinforcement expenditures), prestressed reinforced concrete is successfully used in supporting structures of buildings and engineering structures. A basic shortcoming of reinforced concrete, high weight per volume, is eliminated to a considerable extent by the use of lightweight concrete (with artificial and natural porous fillers) and cellular concrete. Dead loads, Live load or imposed load, Wind load, Snow Load,Earthquake loads. Continue reading Dead loads, Live load or imposed load, Wind load, Snow Load,Earthquake loads.